So despite the reviews, I'm really enjoying No Man's Sky. I'm going to keep posting videos and pictures as I play and talk about my journey to the galactic center here so as not to overload the regular journal since I'm playing quite a bit. I do think the reviews are definitely valid though. It's largely empty despite being such a massive game and the planets that you visit can be hit or miss in terms of beauty, flora and fauna, and resources. You'll also spend a lot of time planet side collecting mundane resources like plutonium and such. Still the exploration factor is quite enjoyable. You can get an idea of the major elements on a planet before hitting atmo, but you really can't tell what the planet will be like. 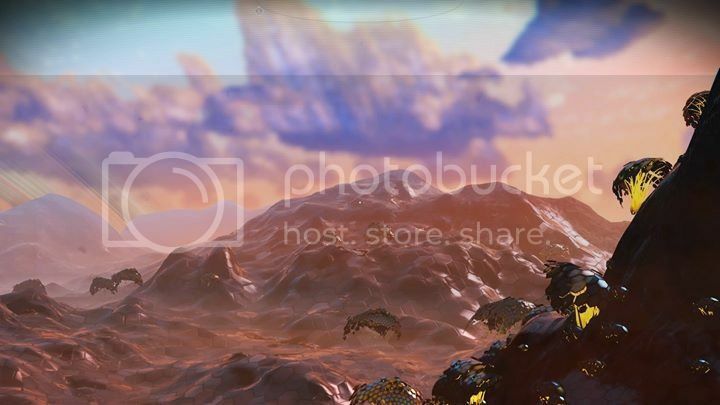 One planet I found was like a beach and ocean planet with lots of water and the land all just looked like a giant beach. I found another desert type planet that was stunning and had giant flying worms to admire. 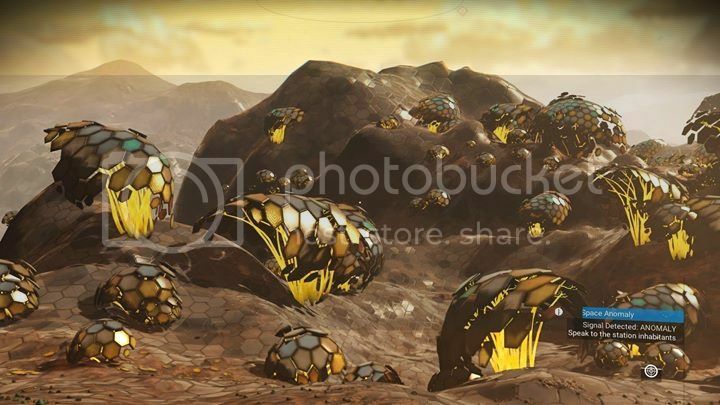 And still another planet was thriving with what appeared to be fungal-based life forms; I called it planet Mario. Finally others are barren and seemingly bereft of life. Yeah, those robotic sentinels swarm quickly when you steal a pearl. After I grew tired of that I moved onto the next system. This system had an available base. I was tempted to go for it since the system had five planets and one moon, but two planets had hostile sentinels. 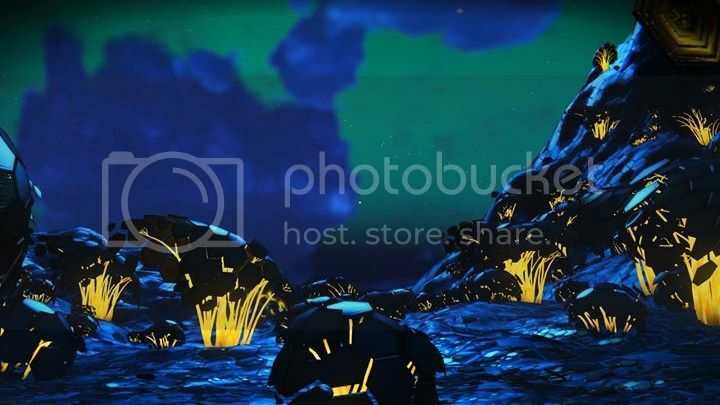 Luck would have it that these two planets were the only ones that had gold, and the available base was on a pretty dull and cold snow planet, so I decided to pass. The system I'm currently exploring also has an available base, so I'm checking out the other planets before I proceed with it, but so far the system looks promising. I'm aware of the massive amount of complaints levied against this game, but I still want to try it. I've always been big on space and the exploration thereof. This looks fun and relaxing. Looking forward to seeing what else you come across. Thanks, Frosty! I hope you enjoy what I have to show. With that said, I didn't play as much today, but I still did get some play time in. I spent most of that time exploring the system I found myself in. It was another pretty nice, resource rich system, though not as resource rich as the one I was in a few days ago. Anyway, I decided not to take the base that was available in this system. Like the last system, this base was on a really cold ice planet. I want my base, when I decide to get it ready, to be on a more temperate planet than that, so I passed. 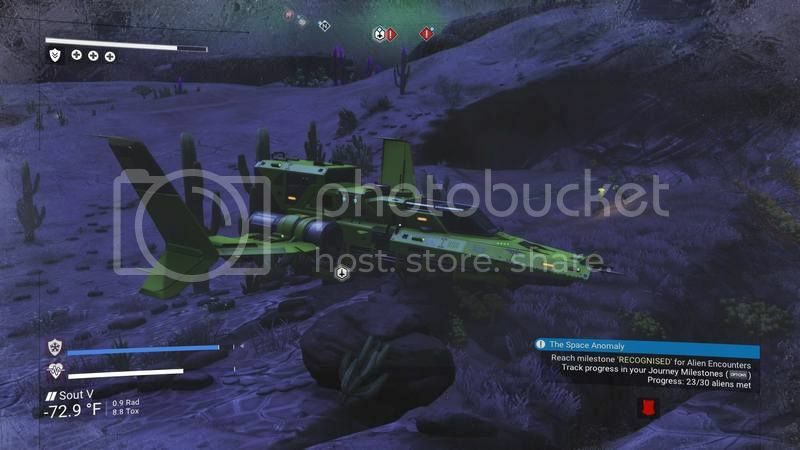 I did find an alien on the same planet as the available base who wanted to get rid of his multi-tool, which was leaps and bounds better than mine, so I swapped him for it. Unfortunately I had to spend 1.5 million units to repair it, so maybe it wasn't as great a deal after all as that was about half of my monies. Still, it now has plenty of slots for upgrades and new weapons. Afterward I moved onto the next system and progressed the story a bit. There are four planets in this system for me to check out, but none appear to have a base available, so maybe on the next one. I'd like to find a planet that suits me, and is in a resource rich system as I'm kind of wanting to put down some roots. That and from what I can tell it looks like the base, once it reaches a certain point, can start generating money and items for you, so I'm all for that. Unfortunately I do have a minor complaint. If your shield runs out, there isn't a good way to recharge it while in the middle of a fight. I went into the full inventory screen in the video. There is an HUD menu you can use, but it's hard to do that and maneuver at the same time regardless. Still, I enjoyed the dogfight a lot! So while can be a relaxing game, Frosty, it can also get intense. And here's a couple of pics. The first is how this game provides you with gold, basically in mountains. 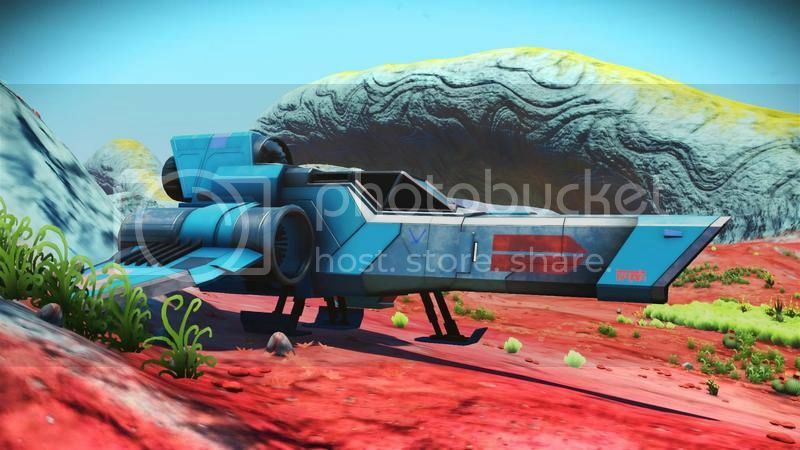 The second is my current ship on one of my favorite planets I've encountered thus far. It was right after I bought it, so I was pretty proud. I'm getting to the point where I'm itching for a new ship, or to find out a way that I can upgrade my current ship. There have been several I could have bought, but I only want fighter class ships. I'm necroing this as I've started playing again thanks to the update that's coming tomorrow. It has taken me a bit to refamiliarize myself with the controls, materials, and, well, basically everything, but I'm getting the hang of it again even if I died a few times. And despite my desire to continue searching for the center of the galaxy (or was it universe? ), I was confused by the option I was given at the anomaly and ended up selecting the Atlas quest. So, not sure what to do now that is the case. The Atlas location is also pretty far away for my ship, so if I have to go there to get back onto the center of the galaxy quest, then I'll be annoyed. Hopefully not, but if I'm able to find some people to play with it will alleviate that annoyance somewhat. I'll try to return to posting pictures/video soon. I've been interested in NMS since launch, but was put off by the awful reviews. All the changes and updates seem really positive, but a question for you: is the multiplayer a required part of it now? Or can you still play a purely single-player game? You can definitely stay single-player now, though I’m not sure if you’ll be able to toggle back and forth. The game does allow multiple save files at any rate, so if nothing else I imagine you could have one game for you playing with others, and another for your solitary journey. Oh cool, good to know. Thanks! Pretty sure I will pick the game up some time this year then. And how, exactly, does the multiplayer work now? I'm looking for a game that me and a couple friends can pop online one evening a week and do stuff together. Will this scratch that itch? I've been interested in this game for some time, but have held off, due to apparent Molyneux-style empty promises made by the developers. Now that at least a few of them have come to fruition, I may finally check it out, ...although I'd be sticking to single player. 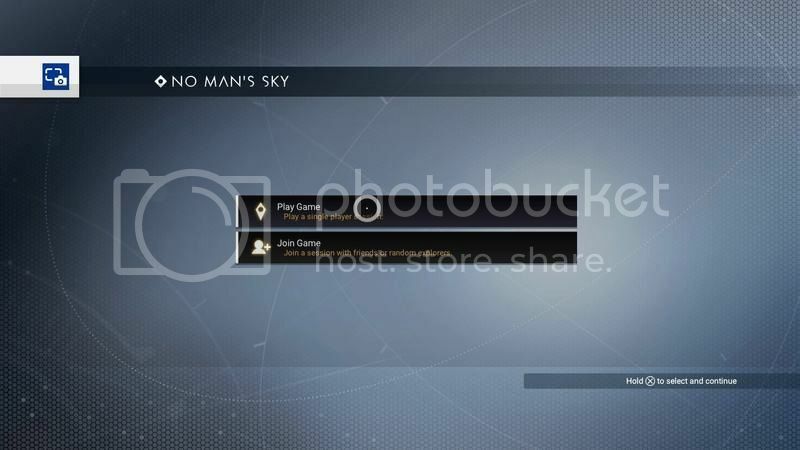 Yes, Playstation Plus is required to do multiplayer. I didn't know either as this is the first game that has made me want to play online. I'm considering it for the time being as I think it may be worthwhile, but we'll see. In the meantime, the new update has thrown a wrench into my solo game as they've changed the items required to fuel your equipment and starship. This isn't a big deal for a lot of things, but unfortunately it has left me stuck in a system without a way to make hyperdrive fuel. Partially this is because I never saw the need to upgrade my mining laser prior to the update as I could get by without. Not so any longer. 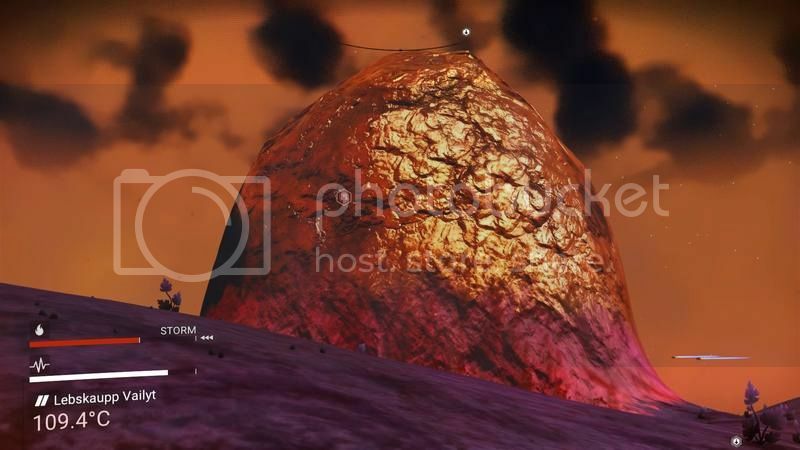 Also, looks like I may need a base to create one of the items I need, but I had never built one previously because you used to have to find planets with available bases and I hadn't found a planet I liked well enough to set up shop there. 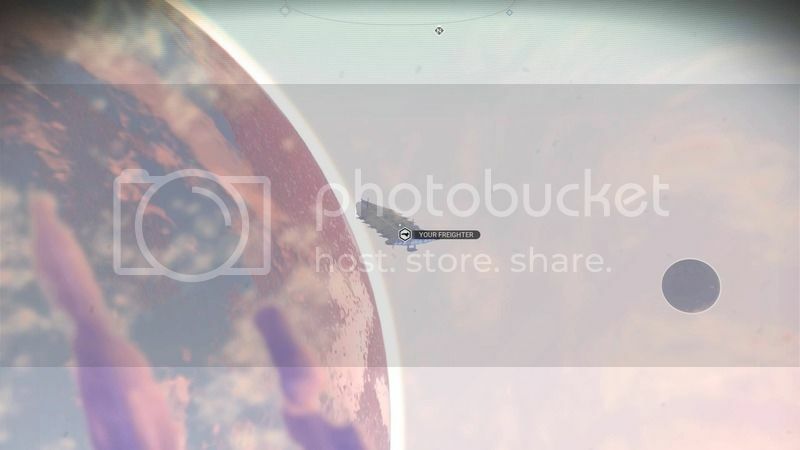 Now you can put one on any planet as well as have multiple bases, so I may need to do that to get out of the system. It's strange how attached you get to the ships. It's like selling a car you had for years and years, and having those sentimental feelings for its loss. My old ship had taken me pretty far, and it is the ship that allowed me to win a dogfight against four pirates for the first time. I was sad to see it go, but am otherwise happy with the new ship. I like the designs. Did you pick the colours? 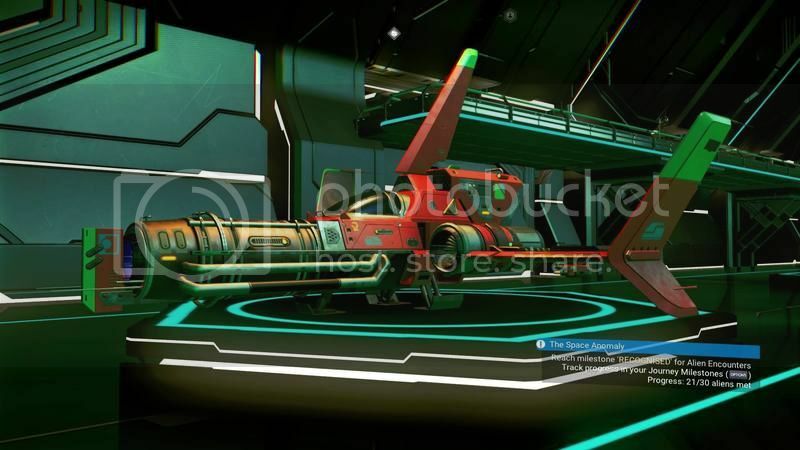 To my knowledge you can’t customize the appearance of starships. Though I honestly don’t know if that kind of mechanic has been included with NEXT. I’ve just taken what I can get so far, but I always get fighter class ships for the maneuverability and bonus damage. Space pirates are a constant threat and I decided early on that I wanted ships that would allow me to keep up with them and dish it out. Once I have a freighter I’ll get some other starship types. I didn’t get to play today, but a friend of mine bought the game yesterday and we’re going to try out multiplayer tomorrow night with space piracy as our goal. I’ve played a lot the past week and I’ve made a lot of progress. I did have to look at some guides to familiarize myself with all the changes NEXT made to everything, but once I learned all that I was able to start progressing finally. I spent a lot of time upgrading my starship’s weapons and shields, and I’m glad I did! I decided to continue with the quest to the galactic center for now, and then I’ll go back to work on the Atlas and Awakening quests. I really hope there is a homing upgrade for my ship’s rockets. I haven’t been spending much time in the systems for the most part. Just landing on the planets and checking them out briefly. Namely because I seem to keep finding planets with hazards of various types. Firestorms, sandstorms, blizzards, radiation, toxicity, and super-heated rainstorms. I’ve been wanting to set up a base on a planet without hazards, but I’m beginning to think those planets don’t exist. So as soon as I find a planet I like in a large-ish system without intense hazards then I’ll build a base. I’m currently in a two planet system on a pretty temperate, resource rich world. I’m going to explore this world and do some missions in this system before continuing on my way. Also, I have done multiplayer with some friends. I’ll write another post about it in a day or two.